“Simple, Smart and Ready” describes the R Series. 80% of in-hospital cardiac cases present with a “non-shockable” rhythm. These patients require life-saving CPR, and the ZOLL R Series CPR Dashboard™, through both audio and visual direction provide the highest quality CPR in the heat of the moment. Survival can on the speed and depth of high quality CPR, and the ZOLL R Series will be your best partner for the important job at hand. ZOLL’s See-Thru CPR® technology brings calm to what can be a chaotic situation. Providers get the right information on the rate and depth of compression without unnecessary interruptions to make assessments. For patients that require both CPR and a shock, the R Series Monitor/Defibrillator’s is Always Code-Ready. Simple: The R Series requires only one therapy cable for defibrillation, cardioversion and pacing. The OneStep™ Complete Resuscitation Electrode has built in 3 leads in the pad which simplifies and streamlines therapy if the patient requires pacing immediately after resuscitation. Smart: Real CPR Help™ provides real-time high-quality CPR delivery. See-Thru CPR eliminates wasted pausing during CPR. The R Series is the only monitor/defibrillator that recognizes the OneStep Pediatric electrode, automatically sensing the need for lower energy settings to 50J to prevent overdosing energy to pediatric patients. Ready: The R Series Monitor and Defibrillator performs a daily automatic self-test. When the readiness indicator has the green check mark visible, the defibrillator is ready to perform. Event documentation, data transfer, record-keeping and archiving are managed through internal memory with a removable compact flash card. When used together with ZOLL’s CodeNet PDA-based code data management system, all important data functions are easily completed. WiFi enabled option is also available. The ZOLL R Series Advanced Life Support Monitor/Defibrillator provides a suite of tools that delivers sophisticated Code-Ready® CPR, defibrillation and pacing therapy in one package. Each feature – CPR Dashboard™, See-Thru CPR® with displayed metrics, OneStep™ family of electrodes and High Current Defibrillation all seamlessly work together to deliver comprehensive cost effective cardiac resuscitation to both adult and pediatric patients. • EtCO2 – CAPNOSTAT® 5 Mainstream CO2 Sensor (use with adult, pediatric, and neonatal patients). Airway adapter not included. Event documentation, data transfer, record-keeping and archiving are managed through internal memory with a removable compact flash card. This data is important for continued quality improvement. When used together with ZOLL’s CodeNet PDA-based code data management system, all important data functions are easily completed. WiFi enabled option is also available. 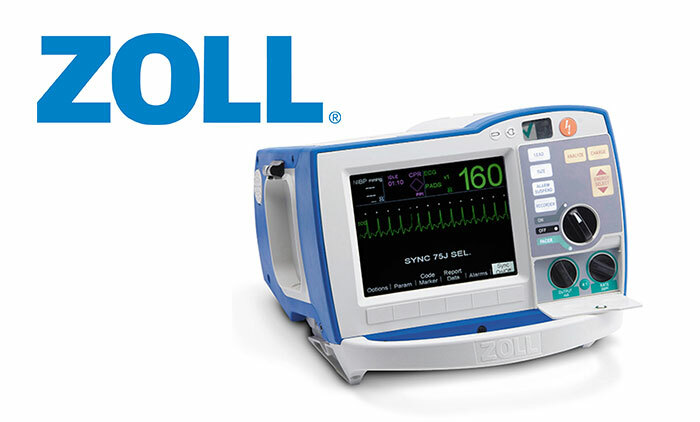 How many ZOLL R Series do you need?